Established to celebrate Queen Victoria’s Diamond Jubilee, Muker Subscription Brass Band - its original title – made its first public appearance on jubilee day, 22 June 1897. At that time, virtually every village in Swaledale had its own little band of ‘ten and a drummer’: today, only Muker and Reeth Bands survive to keep the brass-band tradition - which began in the lead-mining days - alive in the dale. For its first fifty years, Muker Band, like its neighbours, was a small, unambitious, all-male ensemble. Dressed in their Sunday best, the bandsmen - mainly young farmers - turned-out on half-a-dozen occasions in the year for processions, demonstrations, village shows, sports days, and other public celebrations. Largely self-taught, they played a simple and undemanding repertoire, and took no part in serious brass band contests. ‘Social’ rather than ‘competitive’ banding remains a defining characteristic of Muker Silver Band: but in other respects it has changed significantly in the past fifty years. Drawing its players from the whole of Swaledale (with a few from Wensleydale), it is now at full strength, and more than a third of the members are women. We play over twenty public concerts each year, and tackle music which our founding fathers could never have attempted. The Band has also become known and recognised far beyond the Yorkshire Dales. Since the 1980s, its audio recordings and videos have sold thousands of copies: and since 2001, we have undertaken four highly acclaimed overseas tours - to Holland, Dublin, the Rhineland and North Wales. The Band has survived thanks largely to a long tradition of dedicated service and family loyalty. When some of our current members first joined as lads in the 1950s, two veterans from the 1897 band were still playing: and now, two of our own veterans have grandchildren playing alongside them. 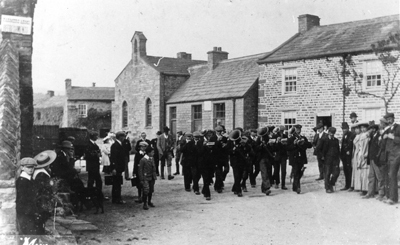 More than a hundred years after it was founded, Muker Silver Band remains an open, village-based, democratic, and self-supporting organisation. Our business is to encourage music-making for pleasure in the community, and we welcome players of all ages and abilities as we seek to keep alive an important strand in Swaledale’s cultural heritage. To learn more about our history, read Duncan Bythell’s Banding in the Dales, published by the Band in 1997 to mark our centenary.